They tell me BSA doesn't stand for "Baby Sitters of America" but, much like a trusted babysitter, adult volunteers do take on the responsibility of keeping youth safe. Their parents expect us to have expertise, sense, and knowledge enough to return the same number of scouts we started with, in pretty much the same condition. I feel that is a reasonable expectation, don't you? So, how do we know how to keep our scouts safe? Expertise comes from experience. You need to actually do stuff in order to be an expert at it. How do you know if a scout is using a knife, stove, rope, or other gear safely unless you are experienced with using it? You don't! You have to actually use the gear yourself first. You can't evaluate the fit and security of hiking boots, backpacks, climbing ropes, life jackets, ... by just reading about it. You can't hike 50 miles, ski a black diamond, or do a one-arm handstand without the experience of building skills to an expert level. We need to continually expand our skills and abilities in order to offer an exciting, safe program for scouts. Sense develops from experience also. Normally, a more mature person makes more careful decisions - this is termed 'common sense'. Boys the age of scouts often don't think things through before making a decision, taking a step, or a flying leap. As adult volunteers, we need to keep a wide-lens view of our activities and step through all the things that might go wrong in our mind before actually trying them for real. I try to ask myself, "What's the worst thing that could happen?" If it's not a serious injury, I get ready to help if needed and see how it plays out. In my sense of safety, climbing trees, crossing streams, swinging from ropes, playing with sticks, throwing small rocks can be done safely. I know all those things could result in serious injury, but so can standing up in a bathtub or walking down your stairs. It is a remote chance. Other activities, such as climbing on the roof, swimming in rapids, and walking the yellow line down the middle of the highway have a higher chance of injury so I would use my sense and say, "Nope!" Knowledge can be obtained many different ways. Experiencing actual situations provides knowledge, but that's not the best way to know how to splint a sprained joint or tie a climber into a harness. We can all increase our knowledge through Training so we know what to do even though we have no experience. I know how to do CPR even though I've never done it on anyone. I was trained on climbing knots before I actually used them. I know 'theoretically' about many things that could happen but have not happened yet and most likely never will. Maintaining a sense of safety while expanding a base of knowledge from training into expertise through practice is a great way to prepare to keep the youth you take out on adventures safe from harm. From their point of view, it's all still dangerous and exciting. From your point of view, it's all under control. And, from the parents' point of view, you are adequately prepared to fufill their expectations. This was the perfect weekend for tons of snow fun! The snow pack has been building for the past month or so and we finally had plenty to build quinzees with snow to spare. The temperature ranged from 10F down to -15F during our campout. In past outings, the snow depth was not enough to cut blocks, but this year I finally got to complete my snow block shelter and here it is. I still needed to finish the door at this point. Not like an igloo which requires larger blocks tapered and banked, this hut has vertical walls with the last few layers starting to lean in. It then has rows of two blocks leaning together at the top to make a vaulted ceiling. This uses less snow than a quinzee and I think it is less work and more fun. Certainly more room inside. I shoveled snow all over it to fill the cracks. Most of the experienced scouts are skilled in making quinzees, but I'm hoping next year some of them might try a block house since there were some interested observers. If nothing else, they enjoyed smashing it on Sunday. In all, the scouts built 8 quinzees and 14 scouts slept out - the rest opted for the indoor shelter. The BSA says that the average Boy Scout troop size is 14 scouts. Lord Baden-Powell is attributed with stating the optimum troop size to be around 32 scouts. Depending on what other activities are available for boys in your area, I believe that number of 32 is close to optimum today. If your scouts tend to participate in half your activities and meetings, then the number could climb to about 50 scouts. More than that and the value to an individual scout from scouting diminishes rapidly and the efforts required of volunteers rises disproportionately. The picture at the right is of a 14-member troop and a 50-member troop - which one looks more fun? Hunger - By being smaller, there is a desire to grow. Scouts have a reason to invite their friends to join. If it already feels crowded and 'full', scouts don't want to grow. The current scouts are also less welcoming to new scouts joining the troop because it means more crowding. More potential scouts are never asked to join. Success - With 40 scouts, the SPL has about 5 or 6 patrols to direct - a reasonable number. He can personally drive the troop to his goals. When an SPL must manage 8 or 10 patrols, the amount of time required becomes exhorbitant. His scouting competes with his schoolwork and his role becomes a job. This results in no scouts willing to take on the huge time commitment or adults taking on more of the logistics and the SPL becoming a figurehead. Mob Anonymity - Chaos thrives in larger numbers. I can get away with more bad behavior when no one can see me. I can go along with others when I'm just one of the herd. A smaller group allows the leaders to notice who is doing what, good or bad. It allows a scout to excel and be noticed, rather than do his best time after time and not be recognized in the crowd. When the SPL raises the sign, it takes a larger group longer to quiet, raising the frustration level and wasting time. Making a Difference - One scout out of 75 not pulling his weight can be absorbed by the rest and he can coast. In a group of 20, every person is important and needs to be relied upon. A larger troop meets the needs of lazy boys that want to just slide by. Time Commitment - There is a certain amount of time required of the scoutmaster to develop a relationship with a scout. It takes the scoutmaster 10 minutes to just say "HI" and shake hands with each scout if there are 50 scouts present. With more scouts, the relationships do not develop. Studies have shown that an individual can only handle a certain number of friends and acquaintances - and Facebook friends are not really friends. Camping - It is much easier to find a location for 3 vehicles and 15 people than 10 vehicles and 50 people. Leave No Trace suffers with larger numbers. Patrols tend to camp much closer together to each other and to adults in larger troops. The probability of actually experiencing any wildlife drops rapidly as a group grows. Challenge - Only one person can be first to ride the rapids or swing on a rope or shoot a gun or whatever the exciting thing is to do. With a larger group, people have to wait their turn longer and the thrill of something new evaporates as we see others doing it before us. Efficiency - The inefficiency of the patrol method becomes more obvious as a troop grows. It makes more sense to combine patrols, buy and cook food for everyone, have one adult manage the gear, and hundreds of other ways to make an outing more efficient. The leadership opportunities for scouts are reduced in proportion to the efficiency introduced by adults. Tardiness - A parent will occasionally be late picking up a scout from a meeting. If a family is late once a year, that seems like no big deal to the family. But, if every family is late once a year in a troop with 60 scouts, the scoutmaster and another adult wind up waiting after EVERY meeting. The same holds for camping departures and returns. Consistency - A scoutmaster with a handful of assistants can easily chat about challenges in the troop, intepretation of requirements, goals for the scouts, and other general directions for the troop. As more adults are involved, individuals promote their own agendas, interpretations, and values which may be contrary to the overall troop's direction. More formal meetings are required for the adults to ensure everyone agrees to the same goals. Even after a general consensus, individuals may still do their own thing in a rogue manner. In a large troop, the scoutmaster can become a manager of adults to whom he has distributed the direct scout interaction, rather than being a role model, mentor, and friend to the scouts. So, what do you do when someone runs their car into yours while you're driving your mom around? 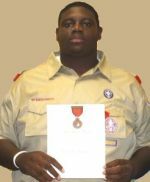 Well, if you're Justin Jackson of Troop 797 in Florida, you follow the Scout Oath and "help other people at all times" and in the process earn the BSA's highest lifesaving award - the Honor Medal with Crossed Palms. In 2009, there were 16 Honor Medals with Crossed Palms awarded and just over 230 since it was created in 1924. In November, some changes were made to the BSA medical form requirements. In case you haven't heard, the one BSA medical form can now be used at all BSA high adventure bases, according to scouting.org information. The one form is also used by everyone, regardless of age. A key requirement for us is that units need to use the height/weight limits when an event takes participants more than 30 minutes away from an emergency vehicle-accessible roadway. In our troop's case, that is often since we backpack, canoe, and other wild outings. Being one of the best troops around, your troop camps rain or shine, hot or cold. Depending on where you are, the 'cold' might be 40 degrees or -40 degrees. Here in Minnesota, our council has a Zero Hero award for scouts that camp out in below 0F temps, but many councils have an award for camping below freezing. Lots of councils call it their Polar Bear award which sounds kind of funny up north here. Whatever the temperature, cold weather camping requires additional training and equipment from the more comfortable summer campouts. 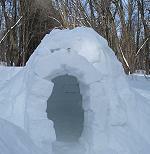 It also might be a challenge to make a cold winter campout much fun since the cold can be uncomfortable. Some winter camping ideas are the usual skiing, sledding, or snowshoeing but those can get 'old hat' after awhile. A great solution is to hold a Klondike Derby for your own troop, other troops in the community, or your entire district. You don't really need snow to hold a Klondike - just modify some of the activities. 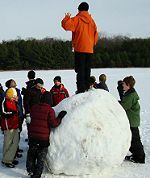 Winter Camping Tips - tips for your instructors to teach the newbies. Snow Snakes - patrols make and race their wooden snakes. Fox Hunt - tracking activity in the snow. All those Bear, Wolf, and Tiger cub scouts had better start selling popcorn and saving their allowance now. The 24th WORLD Jamboree will happen at The Summit in West Virginia in 2019. 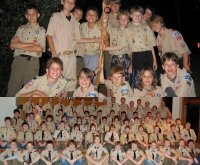 All current Boy Scouts and even most Webelos will have aged out by then, but it's sure excitng news. Scouts Canada, Scouts de Mexico, and the BSA will jointly host the jambo and that sounds like a great way to build cross-border scouting on our continent. Has your troop ever travelled to Canada or Mexico? How about working on an international trek North or South in 2016 or 2017 to become pals with some Mexican or Canadian troop? We should all be trying to keep a scout active, engaged, and growing in character, citizenship, and fitness until he's an adult - that should be the mission of every troop. So, troops basically have identical goals. The way adult volunteers strive to reach the goals, and keep the goals clearly in sight, are what differ. There happen to be nine troops within a 5-mile radius from my home. Scouts have a wide range of selection for the type of troop to join. When a Webelos scout "shops around" with his parents, he sees small and large troops, chaotic and quiet troops, crisp and scruffy troops, and hopefully one of those appeals to him and his folks. I posted about competing scouts and warned about having a winner and many losers too often. Expanding the thought, what about competition between troops? Camporees often have competitions between troops. A Klondike Derby usually has a race or challenge to gather the most gold rocks. These are fun, appropriate competitive activities for bragging rights and patrol/troop pride. Competition on this level helps scouts work on the Scout Law, especially trustworthy, loyal, friendly, courteous, kind, and obedient. But, outside of staged competitions, how should troops interact? When troops compete for members, I think that is where we run into trouble. If you shower a Webelos with attention and trinkets and promises so he joins your troop, do you win? If someone joins a different troop, are you the loser? If you get 8 new scouts and the other troop gets 24, who's the winner? When the district report comes out and you have 2 new Eagles while the other troop has 12, who wins? The trouble starts when we get too caught up in the great American numbers game. To succeed, you need to grow. To win, you need to be the biggest. To be number one, you have to beat everyone else. In Scouting, that is all wrong! Big is not the same as Good. Growth does not equal Success. Everyone really can be number one. Unfortunately, since the Boy Scouts of America is a big business, the "numbers game" exists at national, council, and district levels in the metrics of success. So, naturally, this seeps down to many individual units trying to earn the latest 'growth' recognition. Wouldn't it be better if troops cooperated more? Heck, we're really all on the same team anyway. How can scoutmasters foster cooperation rather than competition between local troops? Know the other scoutmasters. Call and introduce yourself and ask if you can visit a troop meeting. Visit their troop meeting at least once a year. You can learn a ton about how well your troop is operating and you can pick up ideas. Offer joint-troop campouts. If their scoutmaster is game, see if your PLC wants to invite their troop to camp. This would be a good place for competition between all the various patrols of the troops. Invite them to participate in 'community-wide' rather than 'troop-only' recruiting for Webelos, such as a Scoutorama or "Meet the Troops" evening. Consider hosting a "Green Bar" or "Silver/Gold" party - all Patrol Leaders or just SPLs and ASPLs from all troops get together for pizza and then share Roses, Thorns, and Buds about their troops. Use your imagination - what other ideas do you have? Have you ever purchased spoof merit badges? My plan is to recognize scouts after campouts this year. Whether it's because they cooked a great dutch oven meal or were attacked by ferocious mosquitos or a few other occasions, I'm hoping the patches will be a bit of fun and maybe get a few more scouts to participate more. Boy Scout Store also has Scout Coins which I started giving to new scouts last spring. They've been a very popular token with the scouts. You're almost out of time to leave a Wicked Fresh Comment to win a gift card.